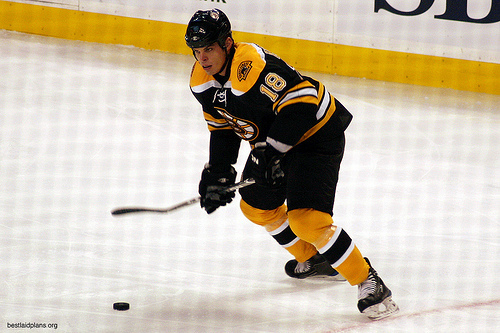 The National Hockey League has fined Boston Bruins forward Nathan Horton an undisclosed amount for spraying a fan with water, according to Bruins general manager Peter Chiarelli. The incident happened while Horton was making his way to the dressing room after game six of the Eastern Conference Final in Tampa Bay. The maximum amount the league could fine Horton was $2,500. A video clip taken of the incident appears to show Horton spraying the fan with water, and then throwing the water bottle at the fan. Earlier this week, the fan told ESPN1040.com that he was heckling Horton at the time of the incident. The NHL’s decision to fine Horton comes two days after NHL deputy commissioner Bill Daly told ESPN Boston that “no action is being contemplated” by the league. Horton has been great for the Bruins in this year’s playoffs. In 18 games, the 25-year-old has eight goals, including two series clinchers. He scored the only goal in Friday night’s game seven win over Tampa Bay to go along with his overtime winner in game seven against Montreal during the first round.